The Sikkim Flower Show was held recently at Gangtok. 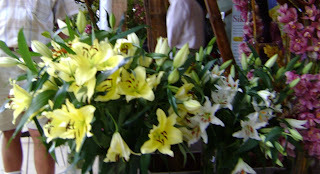 The Asia Lilies and Alstromeria which we used in our exhibition, so often were on display! Yellow rain lilies make a beautiful sight! A sight for tired urban eyes, definitely! you are greeted by a sight like this! The one-inch, lemon yellow flowers of this rain lily spring forth in late summer, at the time when many gardens benefit from a shot of fresh color. These yellow blooms face upwards and flare open, giving them a cheerful appearance. Zephyranthes are commonly called rain lilies since they often come into bloom after it rains. From the Amaryllidaceae family, they are native to the southeastern United States, Central America, and South America. Most are spring or summer flowering. A delightful effect can be produced by planting the species in the grass. The splashing yellow expanse of flowers looks fascinating. It is useful as a border plant in front of the shrubberies and can decorate windows when in shallow pots or bowls. The propagation is by bulbs. Isnt this a lovely interpretation of the Sogetsu triangle vases? Anthuriums and an Asia Lily bud adorn the living room, in a Thai vase. This vase was bought on our last years' trip to Bangkok, by my mother. Too small for the exhibition, but a lovely elegant shape, with one of their guards embossed on it. Maybe the lily has to be a little taller? More chrysanthemums and one Sweet William peeps out. Yellow Chrysanthemums from the exhibition - My worli applique man sits in their shade! The chrysanthemums from the exhibition continue to do well, and they are now at home! With wonderful fellowship through flowers, the weekend and the exhibition are now just a memory. 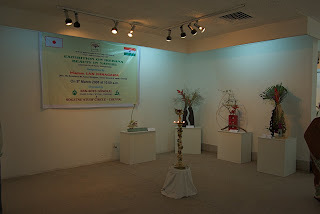 Twelve enthusiastic participants in the exhibition brought out the theme of Beauty in Nature. Friday was a beehive of activity, with the Lalit Kala Akademi floor strewn with cut material, buckets, vines, branches, pots, pans, pinholders and vases. My mother began with her huge pot, and proceeded with focus from one arrangement to the other, not stopping for anything! I on the other hand was in a panic, as my bambbos wouldn't "behave", and the little cans to hold water wouldn't stay where I wanted them to. With much engineering assistance from my father, the terracotta pot with bamboo was done! But time was running on, and I had to hurry on. Incessant chatter filled the hall, as Trishala asked Padma aunty how to make her palm leaf stand, Vaishali called out her suggestions, Prerana made some wisecracks and Pushkala laughed at the confusion. Venkatesh arrived with his sweet imp of a daughter Maithreyi, and there was even more fun and laughter. All through this my mother speeded along through her arrangements and by 4 in the evening, she was all done and ready to correct and review! As was Padma aunty, all set to go! Prerana arrived with lovely masala chai, murukku and biscuits, to refresh us all. In came Chitra and Seethlakshmi at 5 pm, and they were greeted with much banter. While Chitra was determined to use her Dubai vase, Seethalakshmi had a lovely brass container with two bulls on them. 6pm - no sign of Ashok and I was still struggling to get my bricks and the composition to my satisfaction. 7pm - still no sign of Ashok, who doesnt pick up his phone either. Mr niceguy (that's his email id) shows up at 7-30, with a cheery grin, only to be greeted by some tongue lashing from me. Sorry Ashok! Saturday - All arrive early to check on their arrangements. No overnight disasters, thankfully, though there were some drooping flowers. Lan arrived early and had a quick look-see, before the inauguration. It is very heartening for us, to see a Consul General's wife, so enthusiastic and informal and appreciative of our efforts. She went around with Mrs Yakabe again and again, took pictures and seemed to thoroughly enjoy herself. All through the exhibition, we missed Nalini aunty and her earthy humour and straight talk and lovely arrangements. Suddenly at around noon Ashok arrives, and there is a silence as we all stare at his surma-lined eyes and made-up face. He explains that he had just returned from a shoot! He scurried off to the back room to work on his creation. Then it was time for dosais and sambar sadam and thair sadam, which we duly demolished. Then was the fun with the Sun TV crew, as they asked us to walk this way and that, and interviewed my mother. Venkatesh claimed his TV stardom - he was on air every now and then on Sunday. A liitle later, a charming lady called Mamti Chari showed up and made us pose for more photos - I wonder whether all those photos will see the light of the day. (Meenu worked hard to get us much publicity this time, and Mamti was one of her contacts.) She decided that she did not like Tuticorin, much to Venkatesh's bemusement! Sunday came and there was more fellowship. Prerana, Ashok and Pushkala kept us amused and entertained all through the day, as visitors streamed in. Evening came and it was time to dismantle. It never ceases to amaze me, how quickly we can remove what we take hours to put up! We have a wonderful group of members, and here's looking forward to more workshops and more creativity and fun. We do hope that ABK-AOTS Dosokai will continue to sponsor us!! Maybe by the next exhibition, we will have more teachers and more participants! Ashok was enquiring as to what the name for the Erukkum flower is - The one used for Vinayaka/Ganesha. The common names are Giant Milkweed and Sodom's Apple (West Asia). Painted grasshopper feeds on Erukkam (C. gigantea & C. procera ) leaves. on to the link given below & read more. C.gigantea flowers are White to purple, rarely light green yellow or white. Flowers not scented where as C.procera White to pink, scented. Another difference is C.gigantea generally grows up to a large size (8 to 10 ft) while c.procera is shorter and grows up to 3 -- 6 ft.
All of us attended the girls doll festival at the Consul General's home, where we saw this lovely display of dolls. The attention to detail for each doll was amazing, while the finish on the lacquerware was marvelous. As I looked at the headgear and the kimonos, I was left wondering as to why we humans world over make ourselves so uncomfortable! This page has a link on the side, which takes you to the photos of the 2007 exhibition. These photos are hosted on a site called Flickr. I reccomend that all of you sign on to the site. 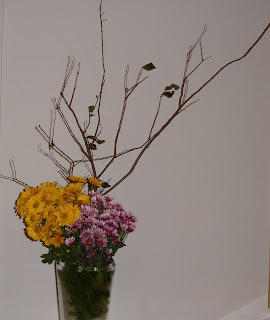 There are many Ikebana and Sogetsu artistes, from all over the world, who share their pictures through Flickr. Some have seen our photos and have been impressed by the pictures.